This is best suited to Texas rigging, weightless worm and presentations in clean to fairly heavy ground across a wide weight and line range. It will handle plugs to the rated specification with ease but is more in tune with crank-baits rod and minnow’s up to around 145mm. It has incredible balance that will work with reels in the 2000 – 3000 without modification and can handle pitching, flipping and overhead casting styles with ease. The rods are counter balanced with the fulcrum point based around the reel stem or, just in front. This is the do it all rod for Bass, Wrasse and a multitude of species from boat, kayak, skishing (wetsuit fishing) and shore. 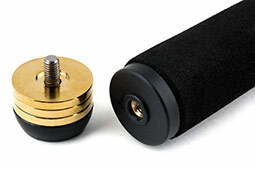 The Staggered tip is recommended for Kayak and Boat where the mid section spigot is removed from the equation. 7-3″ was designed to move the right amount of line on a strike, move around the bow and stern of a kayak and to give enough tip out of the water when skishing. 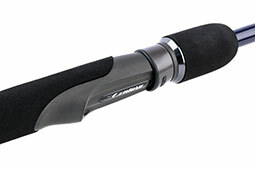 Bite detection is electric and the power in the rod completely seamless no matter the fish size. 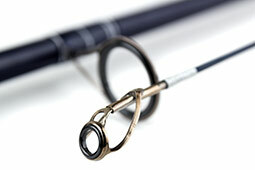 Bass to over 10lb and wrasse to over 6lb have been taken on this model. 3" 3 ½" 4 ½" 6" 6" 8" 9" 10"
3 ½" 4" 4 ½" 5 ½" 6 ¼" 8" 9 ¾" 12"